Do you know your best color palette? One of the things that many women need to understand when choosing new clothes to buy or when going through their closets is that each woman has an individual color palette that can help her determine which colors look best on her. A personal color palette is determined by a woman’s natural coloring, including her skin tone and hair and eye color. A woman without warm tones (such as red or yellow) in her skin, hair, or eye color should focus on cool colors without warm undertones that are striking and bold, such as black, navy or bright blue, and any color that comes across as “pure”, being sure to avoid oranges and browns, as these are inherently warm colors. People with warm tones like golden or reddish hair and peach or golden skin are recommended to do the opposite and embrace oranges, orange-reds, warm pinks, and yellow-greens. Wearing the right colors will help a woman stand out and will help her features come alive! If a woman has pale skin, for example, wearing the wrong colors will make her look washed-out and dull. But if she wears the right colors for her, her skin will look like glowing porcelain. As another example, a woman whose hair has a natural ash tone will find that the wrong colors accentuate the ashy tone too much and can make the hair take on a gray cast. The right colors will help emphasize the other tones in her hair, making it look more appealing. 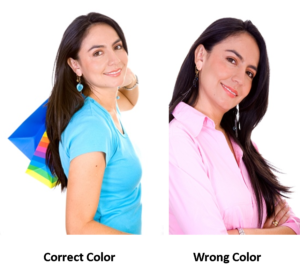 Because each woman differs in her coloring, it is important that she understand the tones that look best on her, and avoid trying to keep up with the fashion Joneses by feeling she has to wear the latest color trends in order to be beautiful. A woman wearing colors in her correct color palette will always be beautiful, unique, and noticeable no matter what is in style. ← Color and Personality: Is there a Link?